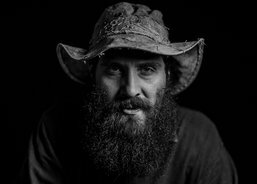 The music and culture of Deep South America has spread all over the world, and if you’ve ever wondered what punky country music would sound like with an Australian accent then you have to go and see William Crighton. William grew up in Riverina, Australia, and if you’re familiar with the genre bending of Frank Turner, imagine something harder edged but with an Aussie twang rather than the Wessex one. William now tours the world assisted by Matt Sherrod on drums and Julieanne Crighton on guitars, vocals and special effects. Wait, special effects? William is famed for both his fraying country but also his experimentation. Below for you we’ve got Devil’s Tongue, and the video for an older cut called Woman Like You which draws Springsteen comparisons. You can see Will at the Black Deer festival this summer.